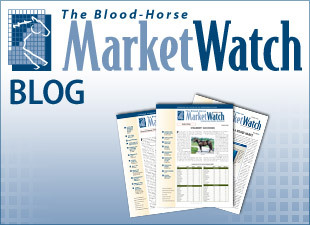 Competition for MarketWatch Broodmare of the Year is always fierce, and 2012’s contest is no exception. Contenders include the dam of a dual classic winner; the mare that foaled 2012’s Horse of the Year; several producers of last year’s Eclipse champions; the dams of a few multi-millionaires; and even multiple grade I producers. Easter Bunnette (dam of Havre de Grace) won a year ago and Vertigineux (dam of Zenyatta) in 2011. Both were dams of the reigning Horse of the Year; will voters choose 2012 Horse of the Year Wise Dan’s dam Lisa Danielle in the online poll? Or perhaps Delta Princess has the edge as the dam of champion older mare Royal Delta—in recent years, after all, the reader survey has rewarded dams of top racemares. 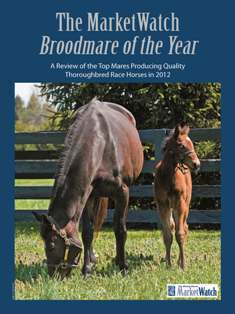 Read the biographies of 2012’s most prominent producers and decide for yourself which one deserves the Broodmare of the Year title. The following pages include 10 profiles, and last year’s nominee Oatsee returns as a contender; her profile is available on the MarketWatch blog. When you’ve determined the mare who’s earned the honor, make sure to vote online. Please enjoy the broodmare profiles presented in the free report and review the associated data charts. When you have settled on a single mare you believe deserves the leading broodmare award, place your vote below—but be aware, the poll closes April 15.